What is the Runtime of a Dyson DC30, DC31, DC34, DC35, DC44, DC56, DC58 & DC59? Here is a brief comparison guide that lists (the DC30, DC31, DC34, DC35, DC44, DC56, DC58 & DC59) & contrasts all the Dyson cordless vacuum cleaner's batteries and their cleaning run times -- including a comparison within their dual mode settings i.e the standard option as well as the boost option, helping you to ultimately get a better understanding between them & to comprehend a clearer choice as to which one is right for you. The Dyson DC30: This is one of the very first handheld vacuum cleaners from Dyson & features a 14.8 volt lithium ion battery that provides a constant suction power for around a total of six minutes (there is no dual power mode on the DC30 version), although some customers say it is closer to 5 (which is safe to say, it is rather lacking in this department) & it takes a lengthy period to recharge 4 hours plus. Find out more on the DC30 here. The Dyson DC31: another handheld vacuum model that was basically made as an 'upgrade' to that of the DC30 -- where it features the dual power mode - providing constant standard suction for a period of 10 minutes & a boost mode (70% more powerful - for tougher stains) for 6 minutes along with a faster recharge time due to the improved 22.2 volt lithium ion battery. Further DC31 specifications. 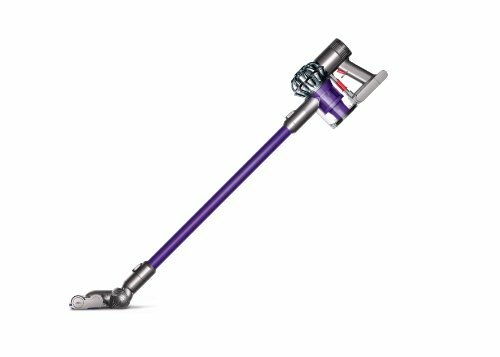 The Dyson DC34: this model was a further improvement still on the DC31 by expanding on the capabilities of the DC31 through extending the suction period to a total 15 minutes on the standard mode (28 Air watts) & then remains with 6 minutes again on the boost mode. Still with the same 22.2 volt lithium ion battery & design specifications. Moreover, it has upgraded power & technology with updated Root cyclone etc. More on the DC34. The Dyson DC35: this is the first release of the Digital Slim range (i.e the mark I) which is basically Dyson's answer to stick vacuum cleaners -- enabling you to basically operate an upright cordless vacuum cleaner that can also be used for ceilings due to it being so light (moreover it has the ability to convert into a handheld vacuum, essentially the DC34). It operates on the same power as the DC34 with 15 minutes on standard mode & 6 minutes on the higher power option. Find out more about the DC35. 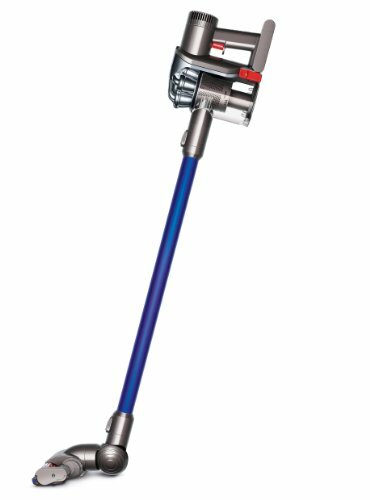 The Dyson DC44 (aka DC45): the DC44/DC45 is basically the second installment of the Digital Slim range (i.e the mark II) which essentially improved on every aspect of the DC35 with regards to power as well as its run time -- allowing it to operate for 20 minutes on the standard mode as well as 8 minutes on the boost mode (note: this is also with greater demands of the battery i.e higher suction etc.). 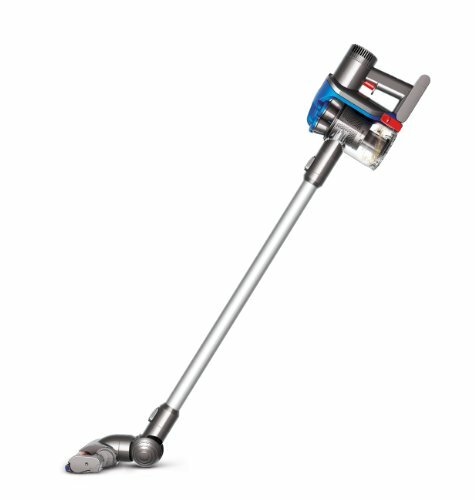 Moreover, it is a 2 in 1 vacuum like that of the DC35, so it was effectively (at the time) the best handheld vacuum cleaner from Dyson also. Find out more about the DC44/DC45 in an in-depth DC35 Vs DC45 comparison. 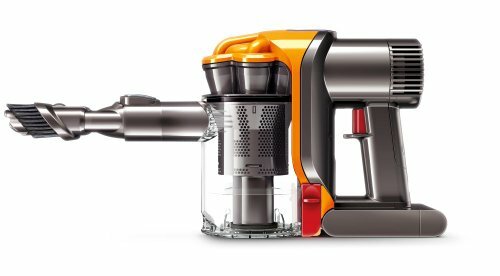 The Dyson DC56 (Hard): a very recent addition to the Dyson cordless vacuum cleaner range is a very unique cordless combination cleaner machine which is basically like the DC35 & DC44 but is solely intended for cleaning hard-floors due to its wiping cleaner head mechanism that has been integrated. Despite improvements in the Digital Slim motor (i.e version 2), the run time on standard mode lasts 15 minutes & for the boost mode 6 minutes -- replicating that of the DC35 essentially with run time but features the power of the DC44. For more details. The Dyson DC58: released as of October 1st 2013, this is set to be the most powerful & probably advanced handheld vacuum cleaner that has ever featured on the market with it encompassing "3 times the suction power of competing vacuum cleaners" (including its predecessor the DC34 as mentioned above). Not only that, it has an approximate battery life of up to 26 minutes (due to the trigger mechanism) & can last for 20 minutes of constant suction action, 10 minutes on higher suction & 6 minutes on boost mode. More details on the DC58. The Dyson DC59: this model is the third & latest installment of the Dyson Digital Slim range (i.e the mark III) & will feature the new cobalt battery (like that of the DC58) which basically enables 50% more power than that of the DC44 as well as also having the same run time as the DC58 of 26 minutes through the trigger mechanism & 6 minutes on its boost mode feature. Moreover, it will be able to essentially turn into the DC58 due it being a 2 in 1 vacuum (simply remove the wand & attach the crevice tool). For more Info. Note: most of the models above will come in two versions (apart from the DC56) -- the multi-floor & animal version e.g. the DC59 Multi-floor & DC59 Animal, but there will be no difference in their run times between them, all that happens is that the latter (Animal) version is provided with a specialised pet hair pick-up attachment. As you can see there has been remarkable progress & advancements on the cordless vacuum range from the DC30 to the DC58, they have made a vacuum almost 5 times as powerful & that can run more than 4 times as long & be charged within less time. Of course, there is a price reflected in these upgrades, the later the model, the more expensive it is going to be so the important aspect to consider here is 'value' -- be sure to get the right match of the performance of the cleaning machine to its price tag -- for me you should be considering a refurbished DC44 as the best overall value within this regard. If you have any questions, comments or concerns either regarding the account 'what is the runtime of a Dyson cordless machine?' or about any of the models specifically mentioned (e.g. what's the mechanical specifications of the DC44) then please do not hesitate to make them in the comments section that you will find just below and we will be sure to get back to you as soon as possible.